One of a kind vacation destination! Sierra Meadows Lodge is located in the heart of Upper Kittitas County's recreational corridor with access to some of the Northwest's premier snowmobiling trails from the front door. This cabin features a tastefully decorated and impressive great room complete with a 52" TV/DVD, a floor to ceiling Ledgestone gas fireplace, a large sectional couch, vaulted pine ceiling, and free WiFi Internet. This home has all the comforts of home including granite counter-tops, stainless appliances, air conditioning and heated floors in 2 of the homes 5 bathrooms. The cabin is located on 3 private acres with easy year around accessibility. There's a pull-through driveway for easy in-out access with snowmobile and boat trailers. Outside you'll find an 8 Person Hot Tub and Fire Pit!! The home features 4 bedrooms plus a large bonus/sleeping room. The 4 well furnished main floor bedrooms have 2 King Beds and 2 Queen Beds. The bonus room has an additional 2 Queen Beds and 4 Twin Beds, Pool Table, and a TV w/DVD! With 5 bathrooms this is a great venue for multiple families. There's a total of 3,400 square feet of living space plus a large deck off the dining/kitchen area for outdoor entertaining in the Summer! This cabin also comes with access to the Roslyn Ridge Activity Center! This new facility just one mile from the cabin boasts a large outdoor Pool, Hot Tub, Tennis Court, Basketball Court, Beach Volleyball, several BBQ Stations with Picnic Tables, Shower/Locker Room Facilities, Conference Room with free WiFi access, exercise bikes and more!! This is a great facility for summer time entertainment. Entrance to the Roslyn Ridge Activity Center is $7/person per day. The entrance fee is charged at the door (cash only). The Roslyn Ridge Activity Center is open between Memorial Day Weekend and Labor Day Weekend. It is also open on the two weekends following Labor Day. The cabin is located blocks from Lake Cle Elum and a short drive to Roslyn or the new Suncadia Resort. From the moment you enter the front door you'll appreciate the quality of this finely appointed vacation home. 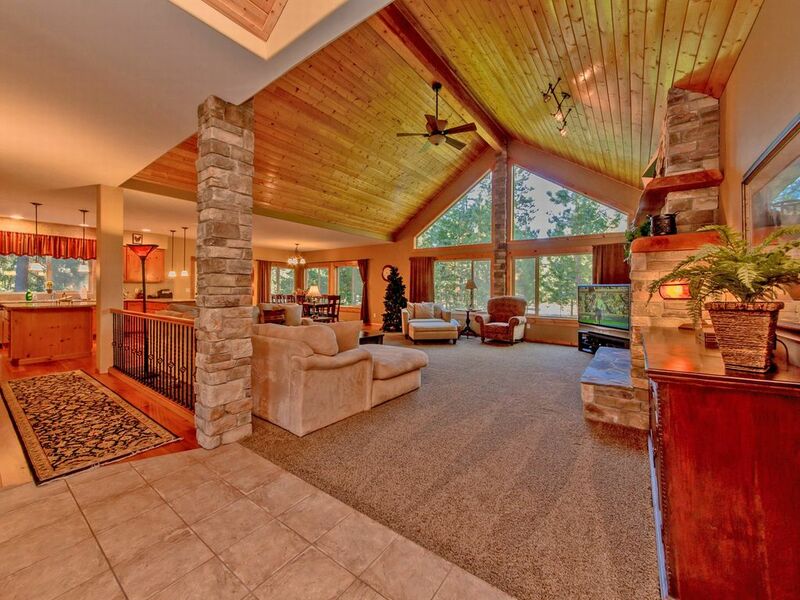 FOR LARGER GROUPS YOU MAY ALSO WANT TO RENT THE 5BR PARADISE LODGE JUST A SHORT WALK DOWN SIERRA LANE. Total of 4 full baths and a 1/2 bath. On 3 acres with a nice, large grass area and private deck with a Hot Tub! Hot Tub, Private location on 3 Acres, Snowmobile from your front door, large grass area, walk or bike 1/2 mile to Lake Cle Elum, only 5 miles from the new Suncadia Resort and world class Golf, pool table, fire pit, pull through driveway for trailers/boats. IPod Player. Access to the private swimming pool facility at Roslyn Ridge just 1 mile from the cabin! Large outdoor Pool, Hot Tub, Tennis, Basketball, Sand Volleyball, etc. Open during the Summer months only. Daily Use fee paid at the door. It was perfect for the amount of people that were with us. Some needed first floor bedrooms and the amount of bathrooms were perfect. Great kitchen and well stocked. The only problem we had was way to many clickers to turn on tv, etc and no directions to work any device. Highly recommend this cabin for large groups, family reunions etc. Lots of sleeping space, huge bunkroom, and the largest great room you've ever seen. Very well-kept and beautiful setting. Plenty of privacy but very close to Cle Elum. The hot tub is a real plus as well. I would encourage anybody to check it out if they are seeking a large meeting place for groups. Sierra Meadows Lodge is a wonderful cabin. We thoroughly enjoyed our stay there - very clean, beautiful surroundings and amazing views. Highly recommended! This was a great property, clean and spacious. Our family celebrated Thanksgiving and we had a great time! Large, accommodations for our family. We had a great time and the house was perfect. Pool Table, 8 person Hot Tub, Snowmobile Friendly, IPod Player, Roslyn Ridge Activity Center Access w/Large Outdoor Pool, Hot Tub, Tennis, Basketball, Sand Volleyball, Locker/Showers, BBQ Stations, and much more!! !